27 Unique and Cool Hat Rack Ideas, Check It Out! 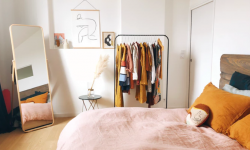 Home / DIY / 27 Unique and Cool Hat Rack Ideas, Check It Out! What comes to mind when I say “hat rack ideas”? I believe you’ll be thinking about the storage of your top accessories. Well, on this page we’ll be focusing on storing your hat or cap properly. There are many ways to organize your head accessories properly. For me, it’s important to keep my hat and cap collection well-organized because it gets me easy to reach the hat I want whenever I need it. 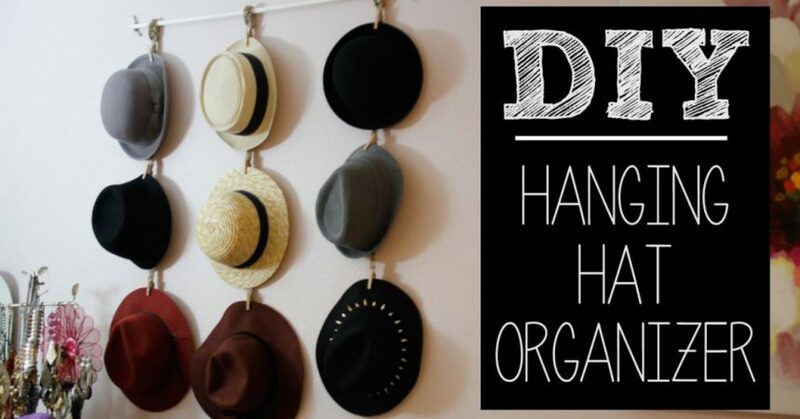 So, you need some clever ideas to organize the hat. You need to search for inspiring ideas that are easy to install and doesn’t bother your budget. Well, the best option that comes to mind is the DIY idea. It would give you some advantages. In this case, the DIY hat racks would be more precise compared to the rack you buy from the store. You can design it based on the size, shape, and additional necessities you need. The most important thing about DIY stuff is that it’s not gonna waste your budget, it can even be free if you already have the material at home. Wood pallet could be a great option for the basic of the rack. You can also build it or coat shelf. As you can see in the picture, this wood pallet concept can also be used to hang bags, purses, scarfs, and coats. Let’s just focusing on the hat collection. For your hat collections, you can add more hooks on the pallet. So, it could handle a lot of hats. Each of the pallets is painted beautifully. The colorful and fun look would make a great decoration for your wall. If you don’t like it for being too colorful, you can just paint it with one color like natural wood, or basically what or black. If your concept of the room is not an elegance, you can use the colorful pallet to make the room more cheerful. The color of your hat can also be a great addition to the color, so make sure it’s in the correct organization of color. After that, you can decide to put the pallet wherever you want. With the white wall as the background, this hat rack idea could be a great decorative option for your empty walls. The colorful is surely becoming the highlight of the room. Do not hide it away. For a room that needs elegance or in a neutral color combination, this colorful addition can be a disturbance to the eye. From the colorful-painted kind of thing, it’s time for exploring the natural charm. If you are a fan of the reclaimed wood pallet, this might be designed for you. Just find 4 wood pallets with the same size and 2 pallets for the back side. There you have it, a reclaimed wood hat rack. You will need some nails and hammer to get all of the woods well connected. There are four hooks on the wood surface that would allow you to hang your coats and scarfs. You can actually build a wider rack in order to hang more hats on this rack. Even though, on the picture you see that the rack is used for clothes, it’s just an example picture. You can use it for caps and hats collection of yours. I guess this reclaimed wood rack would be suitable for the traditional and rustic style of a room. A home barn with a wooden wall texture would make a perfect combination. Your traditional style with this rustic charm is a complete invention. If you are not into rustic, this hat rack looks dirty. Well, you don’t have to think hard about designing a perfect rack. You can just nail down the hooks against the wall, get those hats showcased on the wall. As you can see, hats collection can be a good decoration for your white wall. This would be a great solution for you who are looking for a simple but clever decoration for your plain wall. The color organization from the hats make a great impression surprisingly. I guess you won’t need any additional side decoration around this concept. A good thing about this simple hooks rack concept, you can nail any number of hooks you want. So, it can handle a lot of hats collection you have as long as you have enough space on the wall. It does look good when all of the hats are on the wall. But, if you want to use one of them, one space would be empty. That’s the time when it doesn’t look good. You might need to have some rack for your hats collection but you just don’t have any more space left to use. Well, there’s always space at the back of your door. This is a great solution to save your space. You may need to hide away your hat storage to get the room completely neat. Check out that clothes hanger tails concept for hanging hats. It could be built from a long wood. Install a smaller size of the wood board on that wood and get it attached to precise gaps. In order to get the wood look fresher, you can paint it to the color you want. Or, just leave it to the original shade for letting it look vintage. Some hats collection may not be looking good to be a showcase. It’s because the hats have various size and types. So, the owner wants to hide it away from sight. This is the perfect solution for it. Since it’s hidden, you won’t be able to show your collection off. This hat rack is designed by The Lily Pad. It’s a nautically inspired rack for your hat’s collection. This is very suitable for your children’s accessories. As you can see, it looks really thought to be applied to your kid’s room. It looks so thematic and perfectly fit on the wall. Take a look at the grey plain wall. That’s what makes the hat rack looks outstanding. The rustic textures of the wood shine brighter with that base. Instead of just nailing down the hooks on the rustic wood plank, the designer decides to add a little rustic rope on each plank. I guess it’s not necessary, but it surprisingly creative. For a rustic fan, this super rustic decorative and functional hat rack is designed just for you. In the picture, you see that the hat rack is created for children. Well, a decoration for children should be fun and rustic is not that fun. Looking for unique and clever option of hat rack ideas? This can be a terrific touch for your empty white wall. The thin ropes give an elegance touch to decorate the wall. It won’t look crowded. It’s designed for a small amount of collection. As you can see, One triangle is only suitable for seven to eight hats. That’s the ideal amount of hats you should hang on this concept. If you want to add more hats, I guess you should have one more triangle. Lengthen the ropes is not a recommended option. The glamour look of this thoughtful hat rack design would add a simple decorative touch to your wall but not too much. The space for your hat collection is limited especially if you only have a small space on the wall. If you are in love with simplicity, this multi-functional rack would be lovely. Boat People designed this simple rack to be used for any stuff besides the hat. stuff like caps, scarfs, coats, belts, and other accessories. The basic board is in a concept of the ruler. It looks like a large piece of the ruler with its number of scale. It would be very helpful too for you to decide the scale of the hooks position. It’s only available for four hooks. If you need more hooks to attach, you can choose to find another ruler. This kind of ruler can be found in a grocery store. It’s usually used by the teacher to teach physics or math. The material for this hat rack concept is easy to find. You can even find it at your home without even bother spending your budget for it. That ruler is too thin for a base. A base should be a little bit wider in order to be decorative without the accessories. A base for hat rack could be any form of wood, including a wooden door. Do you have some uninstalled doors left unused in the warehouse? Well, you might want to repurpose it to be the base of a hat rack. Each hat rack would have one door for the base. As you can see in the picture, there are four doors you can use for large collection of a hat. Just attach the door to the wall as steady as possible. Then, you can just install or nail down some hooks to hang the hats. Make sure all the hooks are in the proper order. It won’t be easy to install. I’m pretty sure that this DIY project is gonna be troublesome. The only thing you need for this hat rack concept is some hooks. You can just attach some hooks to the frame of the large mirror. As you can see, there are some little spaces left unused on the frame. This treatment is only suitable for a large mirror because if you only have a small mirror, some hats on the frame would cover the mirror. As you can see, it looks so simple and so easy to install. You just need to nail down some hooks and hang your hats there. That’s how easy it is. If the location of the house is by the beach, it would gladly send a coastline vibe. The clean elegant charm would be spread all over the room. This large mirror would be available for your fashion mix and match. You would enjoy this a lot inside the bedroom. In the picture, the collection of hats are in tone with the reclaimed wood as the frame. For simple elegance in the bedroom, this is a perfect addition. You don’t need to waste space on the wall. You can just leave the wall alone, and let it plain and clean. If you don’t have the mirror, don’t bother buying a new mirror. Just choose another idea. This hat rack is specialized for cowboy hats. You can also call this hat rack idea as hipster style wall rack. It’s inspired by the tapestry seen on the side. The arrangement of material is as simple as it’s seen. Just install the hook to the wall than to get it more festive, some hipster scarfs on each side and ladder wood on top. You will need a large-sized space to create this hat rack. Make sure you install it in tidy order just like the picture. The important thing to do is to make a precise measurement of the gap between the hooks. It would result in a neat looking racks for a cowboy hat in hipster style. For hipster, this is a perfect decoration. It looks like it’s only built for decoration not functional. Whether it’s modern, chic, rustic, vintage, or unique, make sure the idea you pick for the storage of your hat collection is functional. I believe all of the DIY hat rack ideas above are easy to apply.